The search for a fresh start is a classic American story, and one that Zafris makes new with this novel….Low-key but persuasive, this period piece evokes the innocence of an earlier era and underscores the desperation and hope of the eclectic bunch this mom and her kids meet in their pursuit of the new gold. What a wild ride this book is. The characters are plucky, sympathetic, and memorable, the situations sometimes laugh-out-loud funny and sometimes bittersweet, and the pacing just right. Zafris is a keen observer of the human comedy. Just as she did in her New York Times Notable debut novel, The Metal Shredders, Nancy Zafris follows a colorful cast of characters into uncharted fictional territory, this time landing in the canyon country of the desert Southwest in 1954. For motivations as straightforward as striking it rich to reasons far more complex and counfounding, they each embark on very personal divergent journeys across an unforgiving countryside, even while their quest to find uranium unites them. 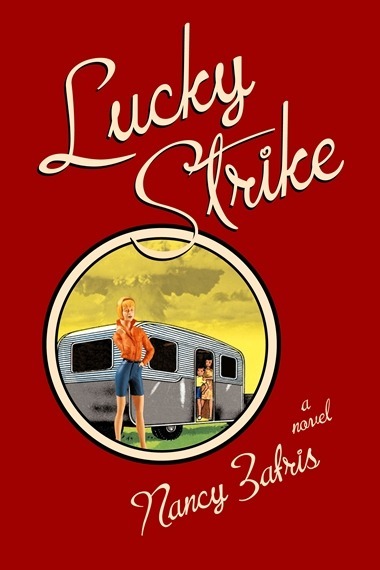 By turns meditative and funny, frightening, witty and refreshingly wise, Lucky Strike explores the ways that language simply put can mine the inexpressable. In the process, a young widow and her two children learn much about uranium but even more about the nature of the love that binds them. This is a story to touch your heart. Late at night, with the children asleep, Jean still kept an eye on the trailer. It would explain something to her if Jo were to go inside to be with him. She was curious how it worked with other people. It wasn’t that mysterious that Jo had married someone like Leonard Dawson—it didn’t flabbergast her the way it did Harry, who was beside himself trying to figure it out. If Jo went inside to be with him in the trailer, that was all the figuring out she needed. She wouldn’t blame her. In its own way it was something hard to resist. But Jo stayed outside and sat on the trailer step, staring out. Now and then she turned and stared at Jean. She stared as if she had the freedom to, as if she couldn’t be spotted in the dark. Yet they could see each other’s faces pretty clearly. The moon was up and their eyes had adjusted. Jean thought Jo looked like some creature. She had stopped being a woman, a human. And in the way you watch any creature, she was waiting for it to make its move. The creature looked right at her, then stood up and matter of factly moved away. In a few minutes it made its reappearance, stooping to pick up the wads of paper strewn over the campsite, returning them to a pile near the stove. It proceeded across the boundary line, melted into the darkness and then re-emerged, standing before Jean, an offering. Jean could smell it, that perfume that lifted off the tent. The tent was eight feet by eleven. It would be hell to pack up in the morning. “If you want, you can sleep in there,” she said. With a flashlight Jean directed her to a corner of the tent piled with clothes she could choose from. When Jo reappeared, she was wearing a man’s undershirt. “Does that feel better?” Jean asked. Jo put a blanket around her shoulders and sat outside with Jean. Jean wondered if she would remember this moment, this silence, this sky of stars. She wanted to. She didn’t have faith that she would. Nancy Zafris is a Flannery O’Connor Award winner for her story collection, The People I Know. Currently the fiction editor of The Kenyon Review, she lives in Columbus, Ohio. Author photo by Jim Zafris.